This entry was posted in 5 Sentence Fiction and tagged Five Sentence Fiction, Photography, Postaday by Danny James. Bookmark the permalink. Wow…this breaks my heart on so many levels. Well done, though. Thanks for your comment. I did visit yours. Very nice story! That last line says it all. I am sure he knew, though, that you read them all. I found it interesting how there were several entries that had to do with older wars and that period, but then I realized that letters aren’t used as much these days, so those that are younger may not relate to them the same way. Yours, especially the way the last line changes focus, is much like a haiku. Very nice! Thanks! You got my point exactly. I referenced in another reply that my wife and I of 22 years have never written each other except for special occasion cards. 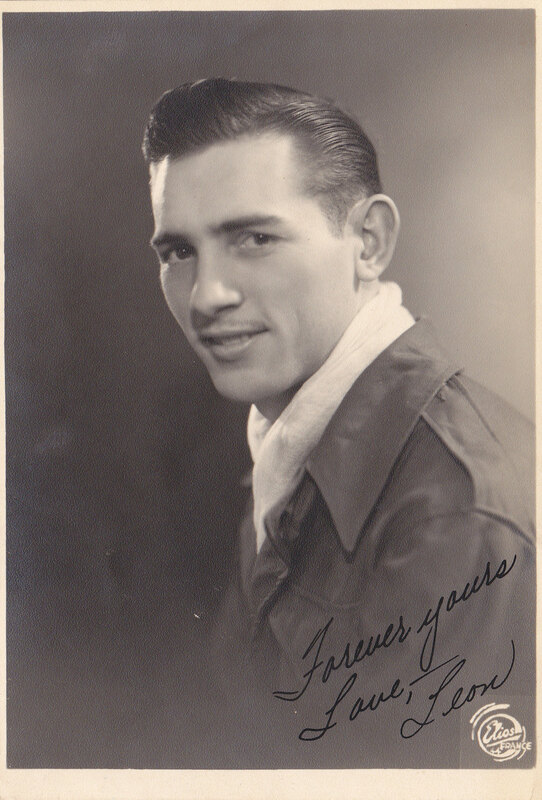 Dad looked like a movie star. What a hottie. My dad’s family share lots of stories and let it all hang out for the most part. But I wish my mom’s family had shared more. Even when you asked, their are many things they didn’t talk about. Most are gone now and it’s too late. And I’m left always wondering. Exactly. Dad’s response was “we don’t talk about that” when I asked him about certain things in our family. And indeed, it’s too late now. I always thought he looked like Clark Gable in that pic. WTF happened to me? Haha! He does look like Clark Gable. I find it interesting we’ve decided to write about LETTERS to home in our responses. In regards to your response, I sense a DEFINITE feeling of remorse going on here where a son is trying to forgive himself for never writing back to his father who probably died during the war. [From the picture it was probably World War II]. I might even go so far as to say that you might be the son I’ve just mentioned. So has my imagination run amok, or have I somehow read between the lines. Curious mind would like to know. Would love to hear your feedback on my response. You just about nailed everything. I am the son. The picture is of my father. He did serve in WW11. Not just trying to forgive myself for not writing but for never really having having communicating to him in general. There were so many stories I would like to here from him if I had just taken the time. Growing up it was all about me. He wrote everyday to my mother while he was in the service. I’m been married and I have NEVER written a letter to my wife. In the age of technology (email, social media, etc) we seem to have lost the ability to communicate in writing to our love ones. When I die they will not find any written communication between me and my wife. Sad! I read between lines in many of these exercises Lillie has given us during the time I’ve been responding, but never with such accuracy. Perhaps I should have played the numbers I thought of as I wrote my response, I’m not going to look at them later tonight now.